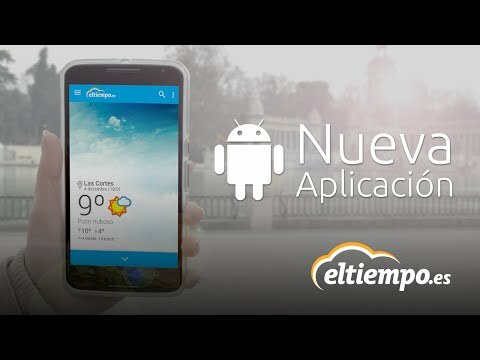 The leading weather app in Spain brings you an upgrade on Android. Eltiempo.es has a completely transformed design on which you can get the most reliable 14-day forecast in over 200,000 areas worldwide. - Get the latest on the weather forecast wherever you are with the new position-based homepage with hourly forecasts and Material Design. Use the side menu to access all the sections on the most comprehensive weather app on Android. - Check the forecast at any time with the upgraded widget without having to access the app. - Find out the weather forecast at your children's school, your team's football stadium or check the weather on the beach before leaving when you plan your holidays. - Upload your own weather related photos by simply using the app and, join our community of over 200,000 web users. - Create your own eltiempo.es postcard: Personalise your photos with geotag weather forecasts and share them with your friends on your social networks. - Check the weather every minute using the Twitter section on the app. - Listen to the weather forecast or activate the weather related sounds to complete the experience. - Hourly weather forecast for the upcoming days. - Forecast for the following 14 days with information on rain, temperatures, real feel, wind, clouds and atmospheric pressure. - Forecast maps for rain, temperatures, pressure, cloudiness in Spain, Europe, the United Kingdom, France and Greece as well as detailed information for the Balearic and Canary islands. - Radar and satellite imagery worldwide. - Coast and boating weather forecasts, wind and water temperature forecasts, as well as maps of the twelve main coastal regions in Spain. - Official severe weather warnings on waves and rain, etc. for all the Spanish islands and mainland. - Extensive information on 1,586 ski resorts worldwide and snowy areas for ski resorts in Spain. - Detailed information on points of interest such as airports, football stadiums, schools, bullrings, beaches and golf courses.